ELGIN, Ill. (WLS) -- Police released a sketch of a man who allegedly jumped out of a van and tried to take a young boy from his stroller in west suburban Elgin. 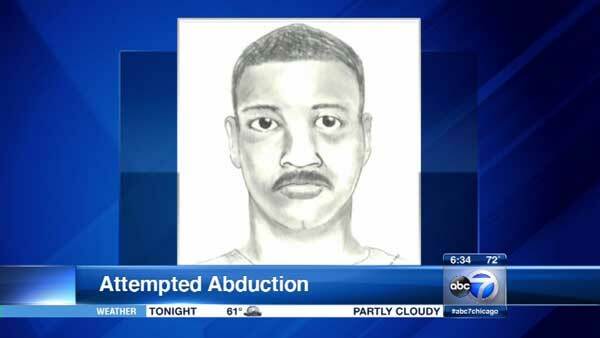 Officers responded to a report of an attempted abduction near Gertrude and Morgan Streets around 8 p.m. on July 9. A 45-year-old woman told police she had taken her grandson and granddaughter, both under the age of 8, on an evening walk when a white cargo van drove by, made a U-turn and stopped in the street near them. She said a male passenger got out, approached her and tried to take her grandson, who was belted into the stroller's seat. The woman told police she wrestled with him and cried for help. She said when he was unable to take the boy he got back in the van and sped off. The children were not hurt. Their grandmother reported minor injuries. "At this point we have no motive as to why this occurred we're still working on that. That is part of our investigation," said Cmdr. Colin Fleury, Elgin Police Department. Police released a sketch of the suspect, who is described as a 30-year-old Hispanic man with black wavy hair and a black moustache. He is about 5 ft. 5 in. tall and weighs around 150 lbs. He was wearing a black short-sleeve t-shirt and blue jeans. He also has a skull tattoo on his right hand. Elgin police are telling the community to stay alert and be vigilant. Anyone with information should call the Elgin Police Department at (847) 289-2619.